Take a trip down memory lane with Grammy winner Ed Sheeran. He pens the world another lyrically layered ballad in “Castle on the Hill,” a nostalgic narration of his journey growing up from his adolescent years. After a year-long hiatus from social media, he reined in 2017 teasing new music through his channels — being his dorky-self, which excites his millions of followers. “Castle on the Hill” draws fans closer to him than ever before as they hear his life story unfold before stardom. This childhood vignette reminds us that every adult was once an innocent child with few responsibilities — that there was a time when ‘rolling down mountain grass’ was the most exhilarating activity you could do. Sheeran pays homage to another great Brit – the living-legend himself, Sir Elton John, who has delivered iconic anthems since the ‘70s. Sheeran sings about returning to his childhood home, where it seems he enjoyed the best time of his life. Perhaps he’s giving his hometown of Framlingham Suffolk credit for his success because growing up elsewhere might have brought him a different outcome. Everyone has that one place that makes them feel safe and loved – the one place that evokes the same tender feelings that Ed belts out in his tenor. The chorus also contains a hidden gem in this track: the rapid high notes Ed toots out during the second and third time he croons the chorus. The control in his voice when switching from low to high notes is one of his strengths as a singer. The next verse continues his journey as a rebellious teenager unconcerned about the consequences of smoking, and binge drinking, in addition to his first kiss. Ed touches upon a very common and relatable aspect of one’s adolescence: curious experimentation. Let’s also not gaze over how he mentions him and others funded those boisterous adventures with part-time or weekend jobs. The bridge of the song is when his trek transitions to the present with a dark, cynical, yet very humane turn. He takes note of his childhood friends and how they are all leading such different lives despite sharing the same “sunset,” a metaphor for growing up in the same town. Some made it, while others faltered. You can hear the emotionally-fueled sorrow in his raspy voice as he wishes they didn’t have to endure their hardships. He slowly sings, “One’s brother overdosed, one’s already on his second wife, one’s just barely getting by.” This is an extremely thought-provoking part of the song, as it makes one ponder the fate of one’s own friends from youth. Did they make it, or are they struggling like some of Ed’s friends are? Musically, this is an experimental song for Ed Sheeran that uses rock-influenced guitar riffs with an upbeat drum undertone. This comeback demonstrates he can do more than soft-spoken love ballads. It continues to illustrate the 25-year-old Ed Sheeran as an ordinary, relatable lad. With lyrics that transcend Framlingham Suffolk, it’d no shocker if Atlantic Records were to have another chart-topper in their hands. 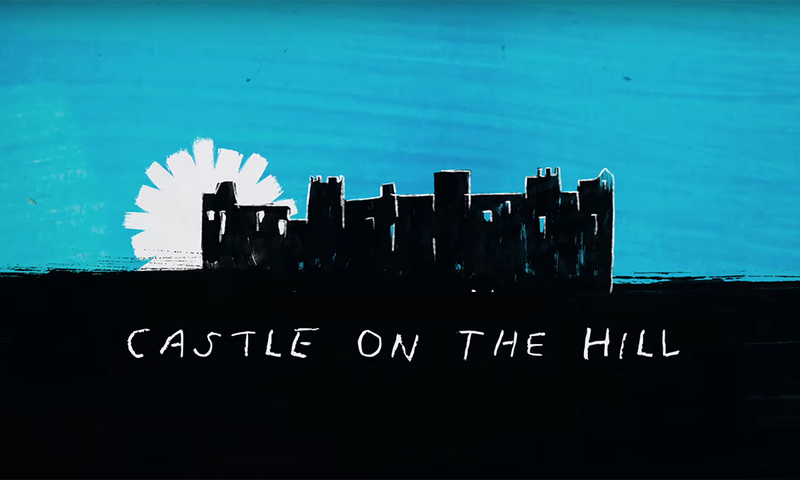 “Castle on the Hill” will keep us satisfied until his upcoming album Divide drops.